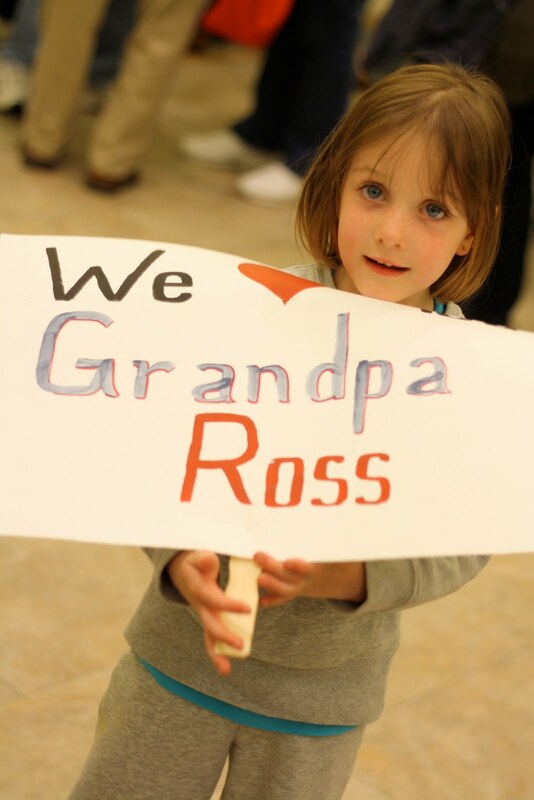 Last Saturday, my Grandpa Ross participated in the once in a lifetime experience of the Badger Honor Flight. The organization takes WWII veterans to Washington D.C. to see the WWII Memorial, Iwo Jima Memorial & Arlington National Cemetery. The families of the veterans are involved in a couple of surprises. The first surprise was "mail call"- we sent letters and cards which were delivered to the vets on the flight home. While serving, the veterans looked forward to getting mail and hearing from their loved ones, so they asked us to show our appreciation for the service given to our country. The second surprise was the Homecoming. Family and friends came to meet the veterans as they arrived home after the memorable day. Banners, flags and posters were encouraged to welcome the men and women home. Our family rented a bus to take the majority of us to the airport for the Homecoming. My mom and a couple of her brothers, tons of cousins and their kids all rode together to see the guy who was really responsible for all of us. It was pretty cool to see young and old together with one common purpose, to honor Grandpa. The wait at the airport was a couple of hours long, but honestly, I didn't really notice. I chatted with aunts and cousins that I don't often see. I watched my children and my cousins' children as they played together, much like we used to play at Grandma & Grandpa's house years ago. I took photos of the growing crowd and listened to the all ladies band that played upbeat music from the WWII era. The time went fast. I wonder if the last 70 years of Grandpa's life, since the war, went that fast. Watching his children grow, have their own families, and then seeing them become grandparents. When the veterans finally arrived and began coming down the stairs and elevator, the room erupted. It was exciting and emotional for the veterans, but also for all of us. The proud men & women were noticeably shocked by the Homecoming turnout. They must have expected to come home and go on with their lives; expecting no accolades or praise for everything they did for all of us. It was an honor and a privilege to be there to welcome Grandpa, and all the others, home again!